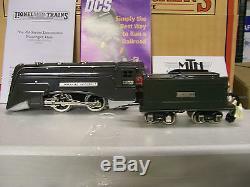 Lionel Corporation MTH # 11-6030-1, O Gauge Steam Loco & All Metal Passenger Set, Protosound 2.0.... 295E O Gauge Distance Control Steam Passenger Train Set w/Proto-Sound 2.0 - Gray/Chrome Set Includes: 265E Steam Engine, 619 Series Coach, 617 Series Coach, 618 Series Observation. Does NOT contain track or transformer. 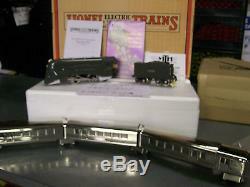 Product Details below provided by MTH trains. In the summer of 1934, Hudson 5344 entered New York Central's West Albany shops; before year-end, it emerged as the Commodore Vanderbilt, America's first streamlined steam locomotive. By the following February, the Commodore was heading NYC's premier train, the Twentieth Century Limited. 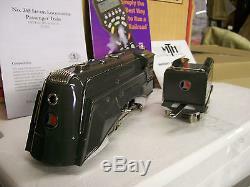 Just months later, two versions of the Commodore appeared in Lionel's 1935 catalog: the budget-priced, red 264E leading the Red Comet set, and the deluxe black 265E, equipped with crosshead and piston, driving rod, connecting rod, and simulated reversing gear. 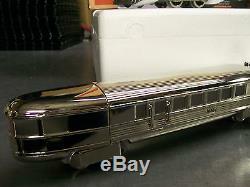 While the actual Commodore was never paired with streamlined stainless steel cars, Lionel created its own modern train by matching the 265E with chrome-plated articulated cars borrowed from its Flying Yankee model - oddly predicting the prototype Empire State Express, a 1941 NYC train that coupled a different streamlined Hudson with gleaming Budd-built passenger cars. Only one other engine ever received Commodore-style streamlining: In 1936 a NYC Mohawk was streamlined to lead the Rexall Train. Proclaiming The Depression is over! And sporting car names that included Firstaid, Kantleek, and Ad-Vantages, the train barnstormed across 47 states to showcase the wonders of the United Drug Company's (Rexall) products. 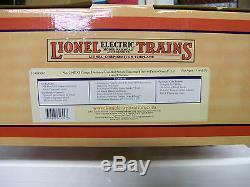 Immensely popular with the public, the blue-and-white train was immediately modeled by Lionel, cataloged as The Blue Streak from 1936-38. Imagine you're a child in the Depression-weary 1930s, when these Commodore Vanderbilt sets captured the excitement and optimism of the newest thing on American rails. 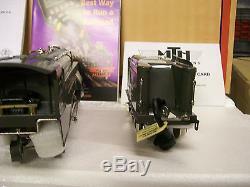 Product Features below provided by MTH Trains. 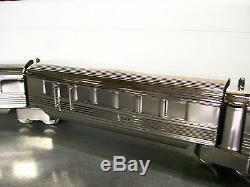 Stamped Metal Boiler & Tender. 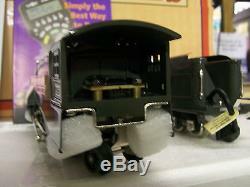 Locomotive Speed Control In Scale MPH Increments. Proto-Sound 2.0 Sound System Featuring Passenger Station Proto-Effects. 20 3/4" x 3 3/8" x 4 1/8. 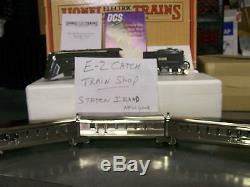 We are also an Authorized MTH Retailer , E-Z Catch Model Train Shop, Staten Island, New York. 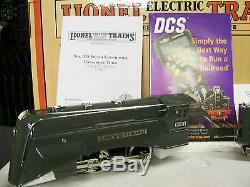 The item "MTH Lionel Corp 295E O Gauge Distance Control Steam Passenger Train Set Proto2.0" is in sale since Thursday, June 4, 2015. 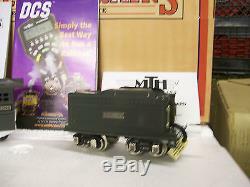 This item is in the category "Toys & Hobbies\Model Railroads & Trains\O Scale\Locomotives". 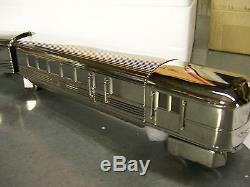 The seller is "fish-n-train" and is located in Staten Island, New York. This item can be shipped to United States.